As our product has evolved to meet the changing needs of our customers, our brand has also evolved. Mailchimp has a new brand identity and design system. Mailchimp has always been a little bit different. Our co-founders, Ben and Dan, started Mailchimp as a side project alongside their web design agency to help their smaller clients with email marketing. Since then, Mailchimp has expanded beyond email and become a leading marketing platform for small businesses. Today, we help millions of customers around the world grow their own way. We want to show our customers that building a successful business means staying true to yourself. With this brand identity and design system, we hope to inspire them to be bold and creative with their own brands. One main goal of this new brand identity is to provide a consistent structure to our design language. We have a lot of creative people with unique voices under one roof, which can be inspiring — and messy. To keep the system from feeling disjointed, we have introduced a framework of core components, so that the elements existing inside of it can be as free and expressive as we want. Our brand framework is made up of persistent and expressive elements, which make room for creativity while maintaining visual harmony. Structural elements like our logo, color palette, and typography keep us grounded and consistent. These core components work together to ensure our brand is recognizable wherever it appears. The flexible elements of our brand celebrate creative expression. Our new approaches to illustration, animation, and photography allow us to communicate with a wider range of emotions, take more risks, and showcase the creativity of our artists and designers. These elements work together to create a system. The Freddie icon has long been our brand’s primary mark. We’ve simplified it a bit, with tweaks to its shape and fine details to make sure it looks great at any size. Previously, our beloved logo script and Freddie icon had hierarchy issues and never appeared together. This meant the icon wasn’t always recognizable on its own. Through a process of iteration and refinement, we've developed a wordmark that lives in harmony with the Freddie icon to build equity for both. The wordmark itself embodies much of Freddie’s unique spirit in its bold and playful characters. It now lives exclusively alongside Freddie in a full logo lockup. We have also made the "c" in Mailchimp lowercased. We used to be an email company, but now we do so much more than that, from automations and ads to landing pages and postcards. Our name now stands for more than its component parts. To help with that mental shift, we now write it as a single word with a capital M: Mailchimp. It can be dressed-up and editorial or casual and approachable. You may have seen its larger cousin on dusty old funk records and inside questionable sandwich shops. Cavendish Yellow is an energetic brand expression building recognition in moments when our voice must be clear and memorable. 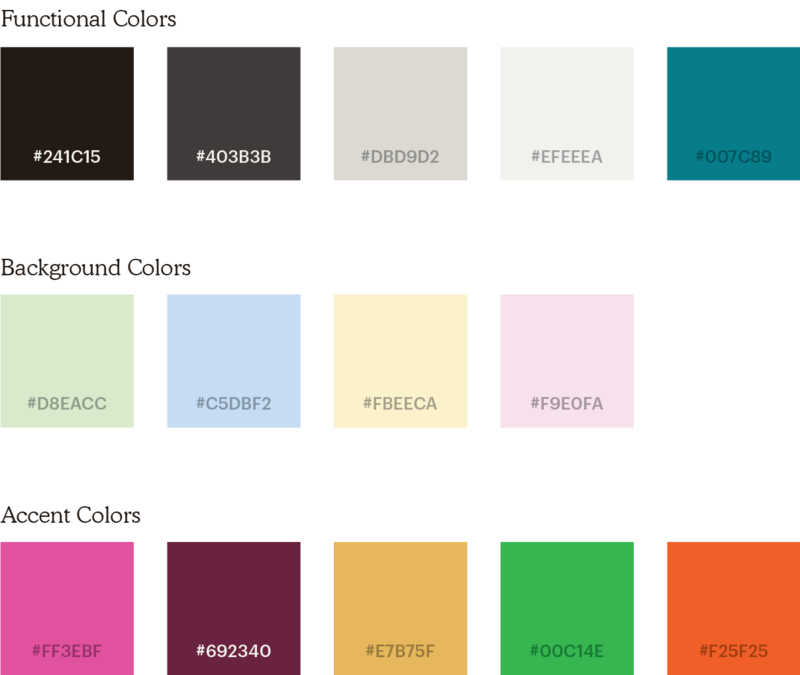 We anchor on a single color, used with purpose, to drive consistency across all properties. Our secondary palette allows us to be more flexible and dynamic. We use this palette in both functional and surprising ways, mostly when we stretch our legs and show up in the world on things like t-shirts or that sticker on your laptop. Our new illustration, motion and photography systems act as the perfect counterpoint to the standardized core brand elements. These expressive parts of our brand are more organic and playful while still communicating a message. Marketing can be complicated, but Mailchimp makes it easier. Our new illustration style allows us to communicate about complex tools and marketing practices in a simpler and more human way. To create the art for this system, we worked with a number of different illustrators around the world in addition to relying on our internal design team. By introducing a variety of artistic voices into our brand, we make room for a diversity of perspectives and visual styles. As we settle into this system in the coming years, we look forward to bringing in an even greater number of people, perspectives and disciplines to grow this system. Our new animation style is a natural extension of the illustration. We create a moving world where creatures, characters, and objects appear free but observed, and familiar but abstracted. We capture the key qualities of the illustrations through movement, and play with motion in unexpected ways. We also use animations to uncover or enhance moments of surprise found in the content. When representing our users and the people in our community through photography, authenticity is essential. We spend time in their spaces and try to capture moments that represent them and their businesses. Exploration and experimentation live at the heart of our brand photography. It finds a message in unexpected places and tells a story through surreal scenes and dreamy landscapes. This new brand embodies so much of what is important to the Mailchimp team — a devotion to craft, a love of creative expression, and an obsession with quality. A number of internal teams and partners have spent the better part of a year working toward this new system. We want to thank COLLINS and R/GA for their steadfast dedication to helping us create and execute this new brand identity and design system. We’re excited to see where it takes us, and we’ll continue to post updates and resources here. If you’re interested in joining our design team, please check out our current openings.